Central Jiefangbei is just one of many newly prosperous districts in the city. Industry in Chongqing is rich and varied, with a major focus on manufacturing and finance attracting young rural workers to the city with promises of higher wages, financial independence and adventure. "There's a lot of of opportunity here. I've been here for six months, selling tickets for the tourists who want to go upriver." From Chaotianmen tourist boats will head out to the Three Gorges Dam, one of the great (and controversial) modern engineering feats of contemporary China. Business is thriving, and at night the boats will light up the river with fluorescent lanterns. It will take around three days to reach their destination, a monolithic structure of steel and concrete 600 kilometres upriver that has come to represent much of the ambition, chutzpah and contradictions of modern China. Chongqing's skyline is rapidly rising and new skyscrapers are built every year. "I worked in a few different factories before I came here, but I’m much happier here. Back there each day was routine. Here I can use my skills. The money's better as well, the harder I work the more I can earn." 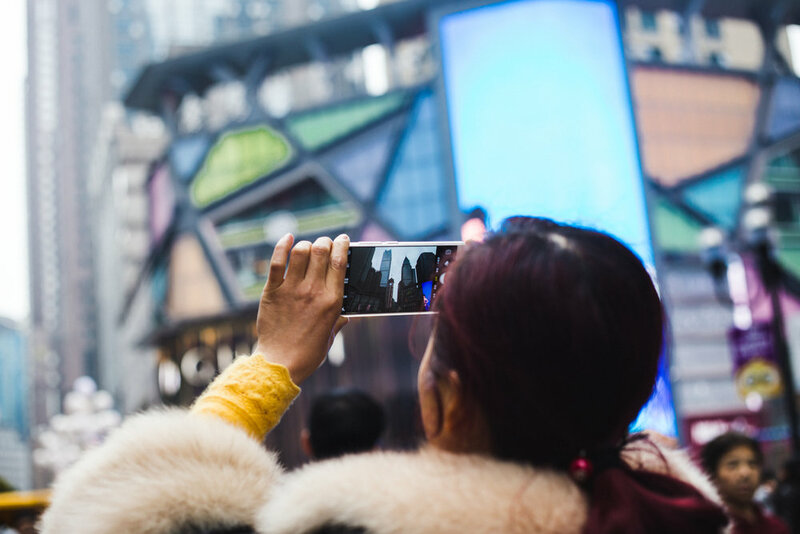 "Our customers come from all over the world"
Since Chongqing Municipality status was designated in 1997, the area has been separated from the adjacent Sichuan Province and given significant bureaucratic, economic and political independence from Beijing. Used as a site for a series of ambitious and sometimes controversial experiments in city planning, internationally focused commerce and social engineering, the skyline is now dominated by high rise apartment blocks, the dynamic business district and skyscraper hotels like the one where Barbara works, just one in a chain of a global high end brand. Much of Chongqing's expansion has been tied to its relationship with Chengdu and Xi'an as part of the West Triangle Special Economic Zone established in 2009. The zone's implementation has established a cooperation framework combining and complementing each city’s infrastructure, resources and economic strategy, and strengthening autonomy from Beijing. The zone now contributes nearly 40% of Western China’s GDP. Chongqing is a city of hills and water. The monorail system - which residents are distinctly proud of - snakes quietly overhead. Riders will be treated to views of a city that clings to the hillsides making up the valleys of the Yangtze and Jialing rivers which flow into one another at the junction where Chongqing's main harbor Chaotianmen is situated. "Pollution is a sacrifice we have made for development"
As old buildings are torn down, new ones spring up to replace them. "The government moved us on a few years ago and relocated us about fifteen minutes walk away. We're lucky it's so close. This was home but life is better where we are." 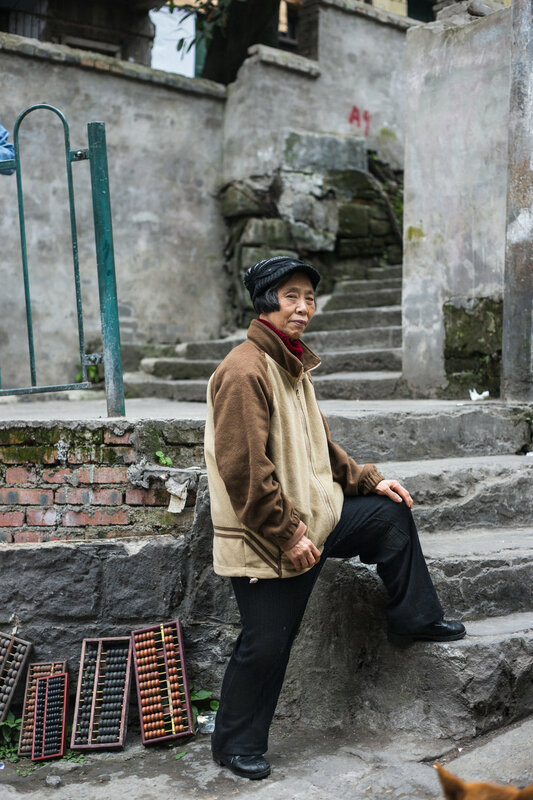 Shibati, meaning "Eighteen Steps" is one of Chongqing's oldest and most traditional neighbourhoods. Recent years have seen the urban village torn down for redevelopment. 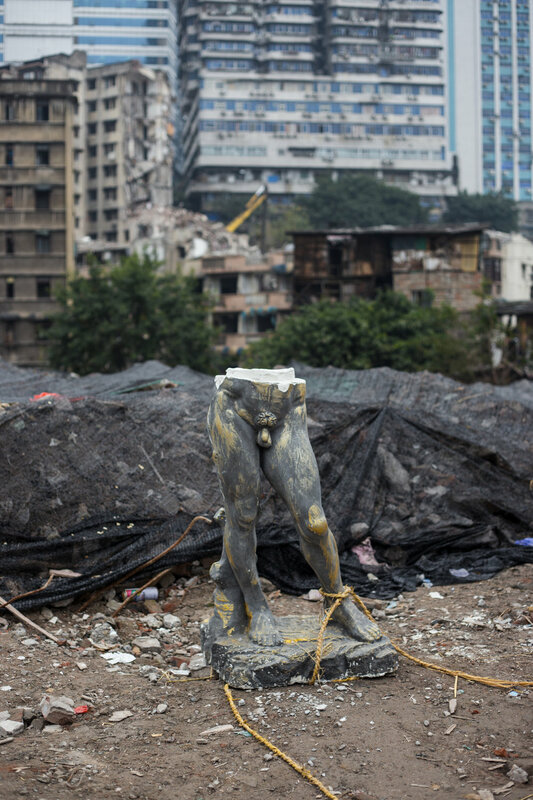 For now, Shibati acts as a laissez-faire tourist hub where street hawkers sell nostalgic paraphernalia and visitors take photographs among the ruins that will soon be replaced with tower blocks. "For now at least, I'll be staying here. Everything just works better in the city, employment, healthcare provision, education. For me to go back would require huge developments like this in the countryside." 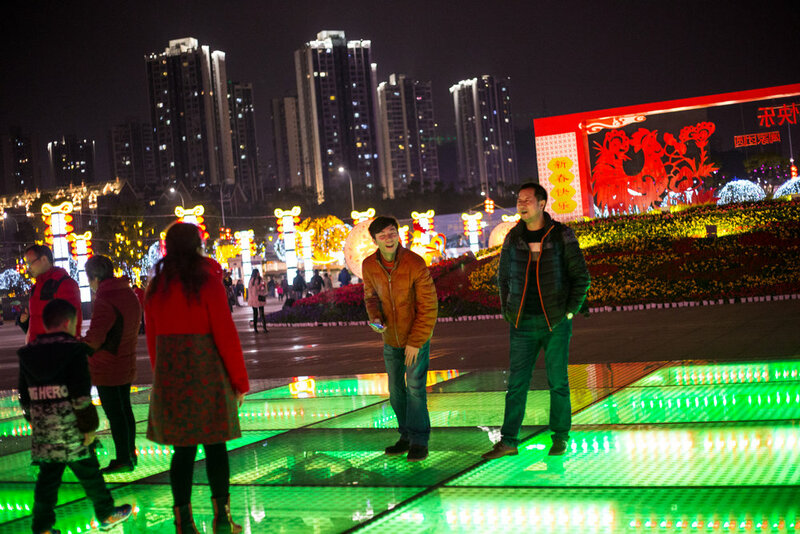 Commuters overlook the Jialing river, lit up at night with neon. 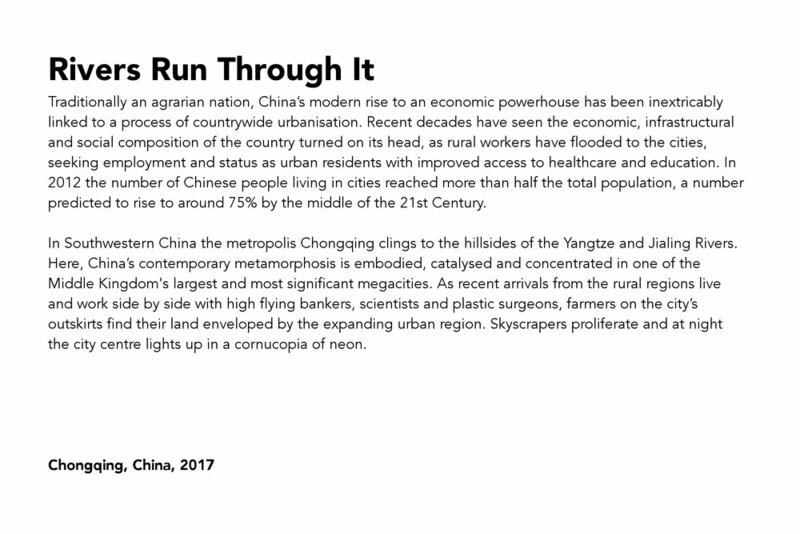 The city is expanding rapidly in a real estate boom that is rapidly changing how and where Chinese society makes its home. Many of the new buildings will be purchased but remain uninhabited for several years. Chongqing Train Station is a major transport hub from which a multitude of workers will arrive to the city every year.